Decorating on a small scale is made all the more complicated in an apartment, where a rental agreement may inhibit some of the renovations you'd like to perform. If you can't incorporate a bathroom vanity or that new eco-friendly toilet quite yet, keep the following bathroom accessories in mind that you can take with you into your next home. Wall sconces are a wonderful choice to add ambiance to your bathroom without doing extensive damage to your walls. Use them to create a sense of uniformity around your medicine cabinet or mirror above your vanity, suggests Better Homes and Gardens. 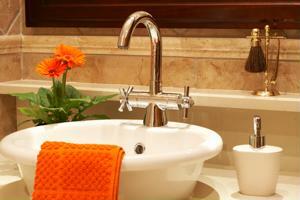 Bright and bold pops of color can be changed seasonally to give your bathroom a fresh aesthetic. Cycle out your linens and window coverings frequently to commemorate different times of the year and use your countertop to display a series of seasonal accents. Last but not least, incorporate small storage options like shelves, storage baskets and wall-mounted linen cabinets. These can help to reduce clutter and can be repurposed in a new context in your next home. What small-scale apartment bathroom adjustments do you suggest for a first-time tenant?